A: It’s for anyone who teaches Religious Education to children aged five to eleven. It gives a good, solid overview of what the Bible says about God and creation, Jesus and creation and our role as part of creation. There’s loads of information, ready-to-tell stories, activities and links to Powerpoint presentations, photos, films and downloadable, copyable materials. Q: Was it a totally solo project? A: No. Mine’s the name in big print on the cover but it wasn’t just me. Glenys Hulme, A Rocha UK’s National Education Coordinator, came up with ideas, did lots of research and, with Julia Major, another volunteer, produced illustrations. Dave Bookless checked the theology and we nicked ideas from the UK education team! A Rocha gets a credit on the cover too. Q: Readers who are primary teachers might be able to use or recommend it. What about anyone who isn’t a teacher? A: Give it a plug to any teachers you know who might be able to use it or draw it to the attention of their colleagues. You could mention it to whoever does the children’s work at your church too. Thanks! Wow! 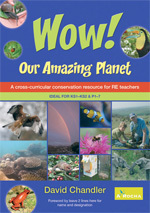 Our Amazing Planet, £9.99, is available from BRF, brfonline.co.uk, or 01865 319700.